We all make them. We all break them. But there are some that writers should make and then stick to. They’re pretty simple and nowhere near as onerous as losing 5 kg. Finish what you are working on. If it’s a novel, complete it. If you write short stories, resolve to finish one a month. Have your work read by someone who’s not a friend or family. Preferably someone who writes something similar to you. Develop a schedule to set aside time to write. It can be as little as fifteen minutes a day, but if you make the resolve, keep to it. Tell your significant others that this is your time and that you are not to be interrupted. If possible, go someplace outside the home. I find the library to be an excellent place for peace and quiet and total aloneness. 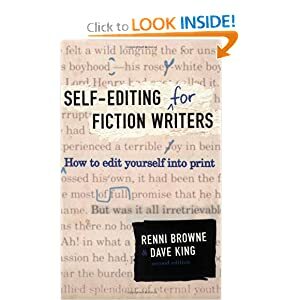 Learn to self-edit. Other techniques I’ve used or been told about by other authors include: print the manuscript out and edit it with a variety of colored highlighters, change the font and size to something radically different, read it aloud, have someone read it aloud to you, make a print copy on such sites as Lulu.com (other sites are CreateSpace.com and iUniverse.com, but I have no familiarity with them). With Lulu you can upload your book and have it formatted for ebook and print for free. Then you have a print copy sent to you — I use the coil bound, since that’s easier to lay the pages flat. One trick is make the manuscript single-spaced. 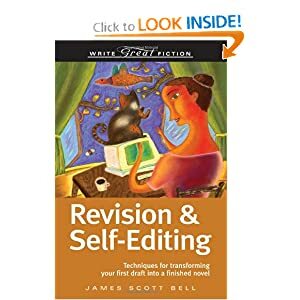 You want it to look like a published book as much as possible. The cost for one book is about $20 USD. Another editing method: if you have a Kindle, mail a PDF copy of your ms to your Kindle address and it will appear on your Kindle. Here are two books I’ve found immensely helpful in my editing. This entry was posted in Uncategorized and tagged editing, writing. Bookmark the permalink.